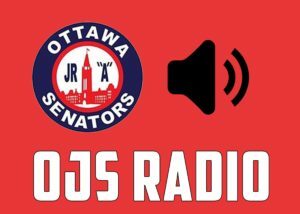 Hard-working first-year winger Andrew Remer has quickly established himself as an important piece of the Junior Senators puzzle as Ottawa heads into the season’s home stretch and looks ahead to the Bogart Cup playoffs. GM/Coach Martin Dagenais and his staff liked what they saw when they observed the youngster on the ice for Detroit Belle Tire more than a year ago. The Ottawa boss reached out to open a dialogue that eventually led to an invitation for Remer to attend camp last June. The 18-year-old impressed the coaches and was offered a spot on the Ottawa roster for the 2018-19 Central Canada Hockey League (CCHL) season. Over 46 games, the Lake Orion, Michigan native has contributed eight goals, including a power-play tally as well as a game-winner against the Cornwall Colts, and 13 assists. He’s also picked his spots to be more physical well, having been whistled for just four minor penalties to date. Most of Remer’s goals have come from in tight, including several off of rebounds. Quick hands, an accurate shot, and a 6-0, 185-pound body certainly help. He also seems to have a natural knack for getting free at just the right moment. It’s not, however, as easy as it looks. For many hockey players the “secret sauce” is work ethic. Growing up, Remer honed his hockey skills playing in the Honeybaked organization before joining Belle Tire a year ago. All of his coaches stressed fundamentals and rewarded effort. Remer admitted it took him a few games to adjust to the CCHL. He has found the level of play challenging and he enjoys playing in places like Pembroke or Brockville where the crowds can get rather loud. An all-around athlete who played travel baseball and is a member of his high school golf team, Remer believes playing other sports—he also played lacrosse for a while—has made him a better hockey player. He notes that the element of competition is still there, while you’re able to work on different skills and look at the game from a different perspective. In between games, practices and going to the gym, Remer is taking online courses so he can graduate from high school in June after he returns home. Meanwhile, he’s getting ready for his next adjustment: playoff hockey, and it’s one he’s planning to meet head on.